EU foreign affairs chief Federica Mogherini and Iranian foreign minister Javad Zarif announced the deail in Vienna following weeks of round-the-clock talks to iron out the details of the deal, which will cut back Tehran's nuclear program and require oversight by the U.N. nuclear agency. Mogherini said the deal is balanced and respects the interests of all sides involved in the talks. She described the agreement as complex, detailed and technical. After she spoke in Vienna, Iranian foreign minister Javad Zarif addressed the crowd of journalists in Persian, saying he was repeating what Mogherini had just said in English. President Obama said "this deal demonstrates that American diplomacy can bring about real and meaningful change." "A comprehensive, long-term deal with Iran that will prevent it from obtaining a nuclear weapon," he said. The president added that he would veto any legislation in the U.S. Congress that would block the agreement. "This deal offers an opportunity to move in a new direction. We should seize it," he added. In a televised address, Iranian President Hassan Rouhani prasied the agreement and said "a new chapter" has begun in relations with the world. U.S. Secretary of State John Kerry, speaking in Vienna Tuesday, welcomed the agreement but warned that “if Iran fails in a material way to live up to" its commitments sanctions "will snap right back into place." The deal will limit Iran's potential development of nuclear weapons while allowing the country to maintain a civil nuclear program, in part by dramatically scaling back the number of Tehran's advanced centrifuges, according to senior U.S. Administration officials. A main sticking point throughout the talks – access by monitors to Iran’s nuclear sites – was addressed with the creation of a mechanism that will allow the U.N. to push for entry, but that gives Iran the right to not immediately acquiesce. Instead ,Iran will be allowed to challenge the request through arbitration. The deal also addresses U.N. embargos on conventional weapons, which Iran – backed by Russia - sought to remove. It upholds the arms ban for five more years and the missile ban for eight, but could end earlier if the IAEA determines Iran has reached the goals of the agreement with regard to dismantling any current work toward nuclear weapons – a charge Tehran has repeatedly denied. In exchange, P5+1 countries agreed to lift economic sanctions on the country as soon as Iran complies with the requirements of the nuclear agreement. U.S. Secretary of State John Kerry spoke with president Barack Obama just before midnight to discuss the deal, which the top diplomat had pushed for through several rounds of grinding negotiations. 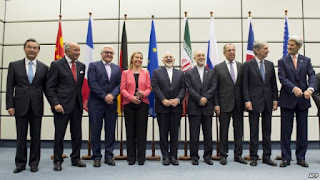 At one point, Zarif, Mogherini and Kerry asked all their staff to leave the negotations table at the Palais Coburg, where for more than two weeks the group had hashed out details that threated to derail the agreement. By the end of the night, as the deal was largely finalized, negotiators were too exhausted for a “triumphant” celebration, a senior U.S. official said. 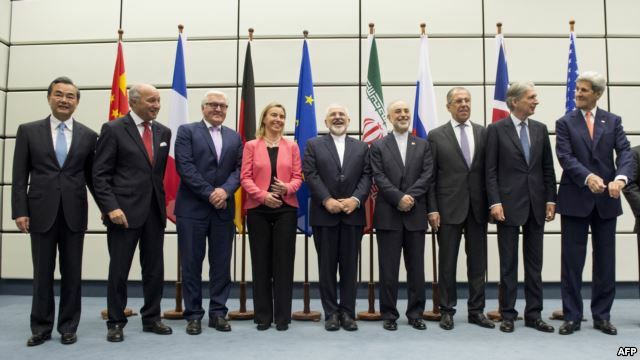 Negotiations in Vienna dragged past multiple deadlines as the two sides worked out important issues such as the access inspectors will have to Iranian sites in order to make sure the government is complying, as well as the pace at which the sanctions would be lifted. The greatest hurdle will be the U.S. Congress, where Republicans have a majority and are expected to vote against the deal after a review period of up to 60 days. President Barack Obama is expected to veto any negative vote. Meanwhile Tuesday, Iran and the U.N.'s nuclear watchdog signed an agreement aimed at answering questions about possible military dimensions to Iran's nuclear program. The International Atomic Energy Agency has tried for years to get answers in its probe, including access to the Parchin military site, but has faced resistance from Iran. IAEA chief Yukiya Amano said the roadmap of expert meetings and items involving Parchin should allow him to issue a report with the agency's final assessment by the middle of December. "This is a significant step forward towards clarifying outstanding issues regarding Iran's nuclear program," he said.